Now I know what it will feel like when Moshiach comes. I know what it will feel like when after 2000 years of crusades and pogroms and wars and at least one nearly successful attempt at genocide, the Jewish people will wake up one morning to discover that overnight the world became peaceful and perfect after millennia of suffering. And I also know now that the “Shehechiyanu” we will recite on that unparalleled Messianic morning will sound exactly like the booming, tear-laced, from-the-bottom-of-your-heart Shehechiyanu that Yonatan Razel (the father of Rivka bat Yael) recited this morning at the bris for his newborn son, Moshe Yosef. 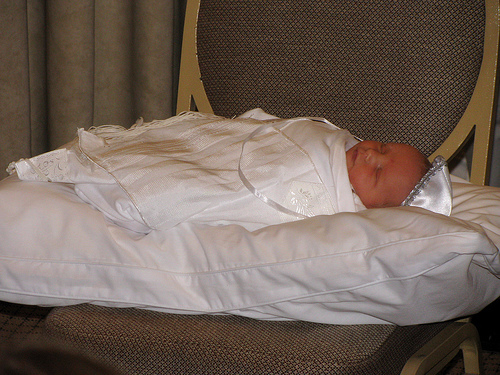 The main reason this bris was so extraordinarily exceptional was that the newborn baby was not the star of the occasion. “It’s a good thing he’s too young to notice…” Yael laughed through her tears when I pointed this out to her. Little Rivki Razel, who doctors were unsure would even survive after she fell from her family’s roof 4 months ago, was at the bris, looking radiant in her pink dress and red hat holding her newborn brother. Rivki seemed calm and happy and even took a few steps but she mostly just sat and enjoyed the company of her new baby brother and her sisters and her cousins and the guests who cried and cried with disbelief as they enjoyed their first glimpse of the miracle girl, the little girl who is walking proof that G-d hears our prayers. May we only have happy news to share! unbelievably amazing news. Tefillah breaks through every gate. i was in jm when it happened and have been praying for your little neshamalah ever since. i’m thrilled – what an amazing bracha.